A fun little cooperative game, reminiscent of (but way better than) Chutes and Ladders, with a space station comprised of five concentric loops connected by chutes and ladders. Players are moles (the animal), trying to collect four items and escape through the center of the board. 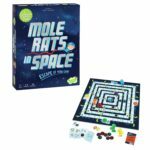 Meanwhile, the space station is filled with snakes who are trying to chomp down on the poor moles. Players first move one or more moles a set number of spaces, as indicated on the top of their card, and then move one or more snakes, as indicated on the bottom of the card. If a snake or mole end its turn on a ladder or chute they automatically move up (or down.) It sounds easy, but the constraints of the board can add to the challenge. Some chutes are deadly (for both moles and snakes) as they lead off the board entirely. I particularly appreciate how player cards are kept face-up, giving the current player an idea of what will need to happen over the course of the next few turns. It presents some challenge, but the difficulty can be slightly adjusted for younger players. Another cooperative game, included in part due to the gimmick of the cute little Dragon. A princess is stationed at the top of a 3D tower and players use a hidden tile matching mechanic (like Concentration) to build up an adjacent tower made up of several floors. Players who choose a Dragon tile have to move the cute Dragon token back a space. When all the floors have been built, a switch is flipped on the dragon and it starts to slowly pull in a short string that is attached to a plastic rock. The rock supports the lowest level of the built-up tower, and when it is pulled out from underneath, the tower collapses. Players use cardboard wands as they race to maneuver the princess token out of the top of the tower and down through the built-up floors (each floor has a small hole) onto the “ground” of the game board. Since the Dragon’s string is only so long, more “mistakes” in the matching game mean the Dragon starts farther from the built-up tower and gives the players less time to move the princess to the finish. A game of (almost) pure chaos using those sticky-hands you can find at the dollar store, the ones that can be flicked onto windows, etc… and stick there. Here, the table is laid out with various cardboard tokens and players race to use their own stretchy Chameleon toy to pick up specific cardboard tokens. Played over several rounds (with different cardboard goals each time) the game is a bit silly, but highly entertaining as players vie to collect the right tokens while also trying to aggressively prevent any other player from doing the same. More of an activity than a game, I’m including Where’s Bear in my holiday list simply because it has been such a huge hit with my youngest who isn’t ready for a full boardgame experience. Where’s Bear? consists of 6 nested boxes and a wooden bear piece. Each box has its own color and is decorated with objects pertaining to a particular room in the house, such as the kitchen or the bathroom. Five different games are listed in the instructions but it is very easy to just make up your own, or simply use the boxes as stackable blocks. I play “find the bear” with my daughter by secretly placing it under a box and then asking her questions about the boxes to give her hints about the bear’s location (either color, item, or other clue about that “room” in the house.) The boxes are sturdy enough to stack easily, and my daughter probably enjoys it the most when I put the bear under the upside-down nested boxes so she has to lift each one in turn until she gets down to the bear. Another slightly older game I encountered this year was the “bag building” game, Automobiles. The core of the game is a several-lap race. Players move their cars by drawing colored cubes out of their personal bag of cubes. Cars can move one space of the appropriate color for each cube drawn. Cubes not used for movement are used to purchase new cubes. Whenever a bag runs out of cubes, all the used and purchase cubes are thrown back in. The basic, monochrome, cubes are used for movement. White cubes are inexpensive but only move cars a small distance. Darker cubes, such as black or dark gray, move cars much farther (but matching color spaces might not always be available.) However, the game also has useless brown cubes representing “wear” on the car, and using darker cubes gives players more wear cubes. Colored cubes can also be purchased and give players special options such as drawing extra cubes, moving in special ways, or eliminating wear cubes. The powers of colored cubes are dictated by cards chosen at the start of the race, so it is never the same mix twice. An expansion, Racing Season, adds in more cards for the colored cubes and has new tracks on which to race (one particular one that’s good for 2 or 3 players.) The expansion also has rules for an ongoing tournament consisting of several races in succession. Players are given a specific driver (complete with a minor special power) and can use special powers on a Sponsor card at the end of each race. Players also keep their ending cube mix for the start of the next race, adding in more strategic decisions as players must decide whether it is more important to win this race, or prepare their cube bag mix for the next. I included the great two team, 8 player real-time Battleship style game Captain Sonar in last year’s guide. While it is a blast to play, it isn’t easy to drum up 8 (or at least 6) players for a full game. The follow-up, Sonar, is designed for two players or teams of two. Once again, players each have their own dry erase game board depicting islands on a 10×10 grid of ocean. The captain player publicly declares their movement (N,E,S,W) and ticks off one point of power for the submarine’s systems. Meanwhile, the opposing radio operator records this movement on a clear plastic overlay on top of their own map. Since submarines are not allowed to pass through their own previous path (or through islands) the radio operator slowly builds up enough information to determine the enemy sub’s location. If the opposition’s location is known, the captain can fire off a torpedo (using all his system’s energy) scoring a hit if correct. Hit the enemy sub twice to win the game. If a captain feels their path has become too restrictive, they can “Surface” which erases their previous course but also reveals their exact location to the enemy. Submarine energy can also be used to ping the location of the enemy or to “run silent” by making a move unannounced. The game quickly devolves into a tense game of cat-and-mouse as players try to locate and avoid being located. Turns are fast and furious and keep the intensity level high throughout the game. One of the more impressive games to get to the table in this year’s guide is Photosynthesis. Players take turns placing 3D cardboard trees onto the board, slowing filling it up to form a forest. Players are trying to score points by collecting sunlight on their trees given off from the “sun” that slowly moves around the outside of the board. Players choose the location as well as the size of their trees when they are placed. Trees can shadow other, smaller trees so one must decide if placing a larger tree where it might get hit by sunlight more often is better than placing a small, inexpensive one that may pay off more in the short run. By the end of the game, the little forest that forms on the board serves as a nice attraction to get the next set of players to sit down for a game. Escape rooms are gaining in popularity so it is only natural for someone to try to bring the same experience into your home. Exit: The Game is a series of (one-use, obviously) games that try to emulate an escape-room experience. Using a colored dial composed of multiple rings and a deck of cards, players attempt to “escape” their situation by solving a series of puzzles. Typically one or more cards serve as a “location” with hidden clues that leave to other puzzle cards. In one game we “unlocked” a new room (card) halfway through giving us more things to figure out. Puzzles range from scrambled words to physical shapes best solved by cutting cards into pieces. There are six games in the Exit: The Game series, handily labeled in difficulty (from 2.5 to 4.5 on a 5 point scale.) As the cards are standard playing card sized, I wouldn’t recommend the game for more than five players since only so many people can look at a given card at the time. If you like the entire idea, there are other choices out there, such as Escape Room: The Game which has a physical plastic box complete with LED timer that requires a specific set of keys to be entered to win the game. Exit: The Game are one-use games while Escape Room: The Game has four different “rooms” in the one box. The “deckbuilding” genre of boardgame came onto the scene with a bang when Dominion was released. Players start with a deck of cards and then use those cards to buy better ones and fold them into their deck. In this way, one’s deck of cards slowly becomes more and more powerful. Hero Realms, loosely based on the popular Star Realms deckbuilder, has players building up decks of cards with a fantasy theme. What gives the game its unique spin are the starting “class” decks available (separately) that give players different starting cards and special powers for use in the game (contrasted with the generic “characters” in the base game.) The game can be played as a normal players vs players game but also has several other unique modes, such as a many vs one game where one player takes the role of a strong “boss” monster. What interests me the most about the game is the option to play through a Campaign deck. A series of linked games played cooperatively where changes to players’ decks (including special reward cards) continue on from one game to the next. The more, the merrier! Party games can accommodate at least 6 players and, unlike some games, tend to be more fun with more players. Hitting the gaming world like a storm, Gloomhaven sold out and continued to generate buzz all year long, currently sitting at #2 for best game of all time (as ranked by BoardGameGeek – the highest profile boardgame site.) Available in retail stores in January, this huge game (over 20 lbs) is a combination of squad-based combat and a choose your own adventure storyline. Players begin the game as one of several class characters and are given a personal, long term goal. The game plays out in scenario-based combat (complete with player miniatures and enemy standees on a set of tiles based around a hex grid) but completion of a scenario leads onwards to new scenario options. Combat revolves around playing two cards from your hand of cards and using one for movement and one for attack. Used cards are discarded and can typically be picked back up by taking a short rest. However, one card is removed from the scenario each time this happens so players’ hands grow progressively smaller. If you’re reduced to less than two cards you are considered “lost” and are done for that scenario. The huge box is required as this is also a “legacy” style game. As players complete scenarios and make story decisions, new areas open up to explore (putting stickers onto the large game map), reputation is tracked, as is the power level of the city of Gloomhaven (opening up better gear and higher level characters.) The game box is full of smaller boxes and decks of cards that bring in new story elements, scenarios, monsters, and perhaps most importantly – new characters. While only a few are available at the start, when a character fulfills their personal, long term goal they MUST retire and a new type of character is unlocked (there are around 17 of them.) You can start again with the same character class if you must, but it would be a different character (new magic items, skills, experience, etc..) Twenty pounds and $140 is a beast of a game by all respects, but there is a LOT of content. One can expect to play through considerably more than 50 scenarios, providing at least that many hours of enjoyment (possibly double that.) Analyzed that way, figure it’s closer to $3 an hour for up to four players, a tough price point to match. That doesn’t even take into account playing the game as a one-off scenario using the “randomly generated” scenario cards. It’s a considerable investment, but worth it for the right players. With October 2017 being the 400th anniversary of the Reformation, how could I not include a boardgame centered on this era of history? Characters such as Martin Luther, John Calvin, Ignatius of Loyola, Henry VIII, Charles V, Francis I, Hernán Cortés, and Nicolaus Copernicus were all active during this time. The game is also epic in scope, but repeated plays are just that, there is not ongoing campaign. Aside from the unique theme, what attracts me to this game are the asymmetric goals and resources of the six sides. There are essentially multiple little wars going on simultaneously. The six sides are the Ottomans, the Hapsburgs, England, France, the Protestants, and the Catholics. While victory points may be earned in several common ways, each side also has very individual goals. The Protestants are trying to translate the bible while the Catholics are building St. Peter’s Cathedral. Of course, the two are also putting forth efforts to “convert” areas of the board to their own breed of religion. England and France are trying to explore the new world, but England is also trying to birth an heir (through repeated divorces and marriages.) The Hapsburgs are busy trying to stay on top between the various forces at work and the Ottomans are just out to pirate as much as possible. This means new players can focus in on the rules most important to them (the religious groups ignore the New World, while almost everyone else can ignore the reformation and its debates. The game is card-driven in that players have a hand of cards they use to perform actions. Cards can be played for their special ability (very thematically tied to events in the period), or are (more frequently) consumed for a number of “action points” that can be spent on more generic activities. This provides the game with plenty of opportunities for negotiation, as players may want to negotiate for an opponent to play the card’s special action instead. Yes, the game has a strong old-school wargame feel in both size and scope, but the theme and the use of the special action cards keeps it from bogging down into a simple clash between different sets of counters. Here I Stand stands out from the crowd of heavy boardgames because of its unique theme and how that theme cleanly ties into a six player game where everyone has their own unique agenda. If you already have favorite games in your collection, you may be pleasantly surprised to find there are expansions available to breathe new life into old favorites. A new (double sided) Ticket to Ride map offers up France and The Old West. In France, players can choose the color of routes on the board while the Old West adds in a sixth player and requires to players to always build out from already laid tracks. Younger players can take on the European version of the simpler Ticket to Ride: First Journeys. The highly acclaimed cooperative game, Pandemic Legacy, is back again with a new Season 2 of play. Here you start the game on islands in a world ravaged by plague. As before, the game board, cards, and options permanently change each time you play to provide an overarching experience over a dozen or so plays. Splendor, that popular gem-trading game from a couple years ago is back with Cities of Splendor, a set of four expansions that each provide a different, new way to play. Fans of Captain Sonar (see Sonar, listed above) can get ahold of the Captain Sonar: Upgrade One, which adds in new boards, new weapons, and more dry erase markers. Flip City is unique as a deckbuilder for its size but also for its lack of a hand of cards. Instead, players hold their deck of cards face-up and play one card at a time until they decide to quit. Some cards have an “unhappy” face and a player who places three on the board loses their turn. This seems easy to avoid but several cards force you to play the next one, so “busting out” with three unhappy symbols is not uncommon. As a deckbuilder, players are trying to use their cards to purchase better ones in order to improve their deck and have a strong finish. Players can purchase new cards (put into their discards) which are shuffled in when their deck runs out. However, cards must be kept face up because every type of card has a different back side and players can choose to upgrade (by “flipping” the card over) their cards instead of (or in addition to) buying new ones. In this way, the game continues until one player is able to play enough point-cards in one turn to win the game. Flip City has a base game, a small expansion (Reuse and Recycle), as well as a fully compatible sequel (Wilderness.) Reuse and Recycle has some nice cards but I feel that playing the Wilderness version by itself relies too heavily on actions that occur when purchasing cards and does not have good ways to remove unhelpful cards from one’s deck. However, I do enjoy mixing in the Wilderness cards with the base deck, as they add to the variety without running into the deck clogging issues. A surprising amount of strategy and enjoyment can be found in this small deckbuilder, so it gets a thumbs up from me. The big multi-platform release this past fall for Dungeons and Dragons (now in its 5th edition) was Tomb of Annihilation. Focused on adventures in an isolated southern continent, it is full of jungles, dinosaurs, and yes, a big old dangerous tomb filled with danger. (Yes, two times the danger of a normal tomb…) In addition to the hardback adventure itself ($50), gamers could pick up the Tomb of Annihilation boardgame ($80), a line of miniatures, a special set of dice in a tin ($20), and a computer version of the boardgame. If Tomb raiding isn’t your thing, Wizards of the Coast has also released its first major book expanding player options, Xanathar’s Guide to Everything ($50). It contains new character options like subclasses, spells, and feats as well as new rule options for DMs. The popular Pathfinder fantasy RPG has been shot into outer space in Starfinder. Starfinder is an entirely new game based around some of Pathfinder’s core rules. Players portray alien species exploring the star lanes, including rules for ship combat and ways to include individual characters in the battles. The release features a book of aliens (Alien Archive – $30) and a new series of adventures ($23 each) set in and around Absalom Station, a large space station which serves as the hub of activity in the series. I’m always on the hunt to find quality RPG material to play with my (young-ish) kids. They’re able to mostly follow along with the rules of 5th Edition D&D but it is nice to find adventures that are a good fit with that age group. The four-part BASIC series from AAW Games leads kids through a series of 5th Edition fall-holiday themed adventures. The storyline and content are designed for beginning players, having the adventures focused around a school for adventurers. The adventures even include a grading system so players can measure up how well they performed. Playground Adventures is another company making beginner modules (for D&D and Pathfinder.) Adventures tend to focus on traditional kid fare like Alice in Wonderland, pixies, and other mostly non-threatening material. There are even a few that chuck in some bonus learning, such as For the Hive, an adventure based around bees that includes some fun facts about bees in general. Finally, Hero Kids by Hero Forge Games is a simplified RPG that has piles of additional material in the forms of adventures, settings, and characters (serving as character classes) available. One nice bonus with Hero Kids are the inclusion of nice maps, pictures of the “bad guys”, and even line drawn art of the characters, suitable for coloring.